Think of the time when you had created databases on your computer and wanted to view it on your Smart Phone when you are away from your computer. Convert your MS Access, FoxPro, dBase, Excel, MySQL or any ODBC enabled database to PDB, and then you can view it on Sony Ericsson Mobile device. View & Synchronize Microsoft Access, Excel, Oracle, Foxpro, dBase or any ODBC enabled database with Pocket PC. Add, Delete, Modify Database records on Pocke PC.Get updated desktop data on Pocke PC and Pocke PC data on desktop automatically. 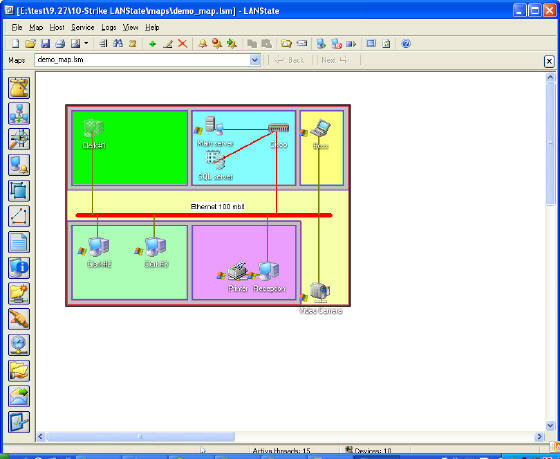 A network management and administration software. LANState has host-monitoring functionality ,it builds and displays a network map, monitoring device's state. It allows system administrators to access and manage network devices. This all-in-one tool allows you to create a database without having any special knowledge or skills. Brilliant DB can easily maintain a database, which can contain information about personnel, customers, goods, and important papers. Battery Monitoring is a useful tool for Laptop, which shows the battery status of remaining. It is very easy to install and use. When the laptop battery is low, Battery Monitoring will remind you using a WAV file. You are free to download it.